The Army wants a new pistol again? We’ve been playing this game off and on for a long time now. They Army is wanting something fresh. Which means the Good Old Boys are not in the running… The SIG’s, the Colt, the normal choices are out. They want something new. But the Army is all about having that Manual Safety. That leaves something from HK, one of the FNH FNX pistols, or the Beretta PX4 Storm. I’m betting on the Storm. Okay – just a couple years ago, the US Army threw down a contract with Beretta that’s basically good for five years. So we’re looking at at least another 3 years of Beretta M9’s. Then late last year, the US Army dropped 49 million dollars on holsters for the Beretta M9. And now they want to shake that tree? Doesn’t make sense. But the Military never let that stop them before. Making sense is for Civilian Contractors – not the Actual Military. But since there are contracts in place, it kind of makes sense that the replacement will be a Beretta. 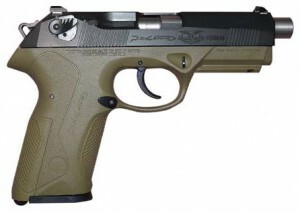 The Px4 Storm would be a great sidearm for the Military. The safety and trigger are the exact same that they are used to, so no new training issues. The Storm’s action does a great job of reducing felt recoil. Accuracy and Reliability are top notch. Mostly likely though the M9’s replacement could be an M9A1… which all those new holsters will already fit. But really this isn’t so much about the pistol, but the cartridge. Basically the Army is looking at more powerful rounds. .357 SIG, .40 Cal, and .45 are the likely candidates of course. I’m not sure the US Army wants to go back to the .45 because they Army loves higher capacity and going back to .45 Auto would show they made a big freaking mistake going away from it. Even though we have a history of using .45, dumping it, going back to it, then dumping it again… Picking something else would break that cycle of abuse. Realistically this means .40 cal or .357 SIG. Either way, I’m fine with these choices. But if I had my druthers, it would be the .40. Between these two. Of course, I’d love it if we went to 10mm. But that’s just not happening because 10mm is never going to get the recognition that it deserves. Because of The Prophesy. It’s written. I like the heavier bullet weights with the .40. But on the battlefield the higher velocity and greater accuracy will give the .357 SIG the edge. .357 SIG just makes it easier to hit the target when it’s at unknown distances. The Sig round also gives us better barrier penetration. The downside of cost is not a consideration for the US Military. But the requirement of more frequent spring swaps will be. The military is not used to replacing parts at regular round count intervals. But this is something that they can get used to doing. So a Px4 Storm or an M9A1 chambered in .357 SIG would be a likely and logical replacement to the 9mm M9. The story of the 3 young lads, kidnapped and murdered in Israel truly breaks my heart. Hamas is to blame, but Palestine as a whole is accountable. Their whole culture is about hate. They teach hate from a young age and feed off it for the rest of their lives. Truly disgusting. What’s worse is the Palestinians the news agencies find to comment on it. Even more disgusting that the killings were not seen as a bad thing by these people. All they can do is point bloody fingers at Israel and get completely hysterical and froth at the mouth. I found the response by Prime Minister Benjamin Netanyahu to be absolutely on point. Netanyahu had composure and dignity and righteous anger… Man – how would it be to have a Leader like that in the USA? With everything going on in the USA – we look to Leadership and we find none. Instead, we have a limp noodle that is destroying America as much as he possibly can.